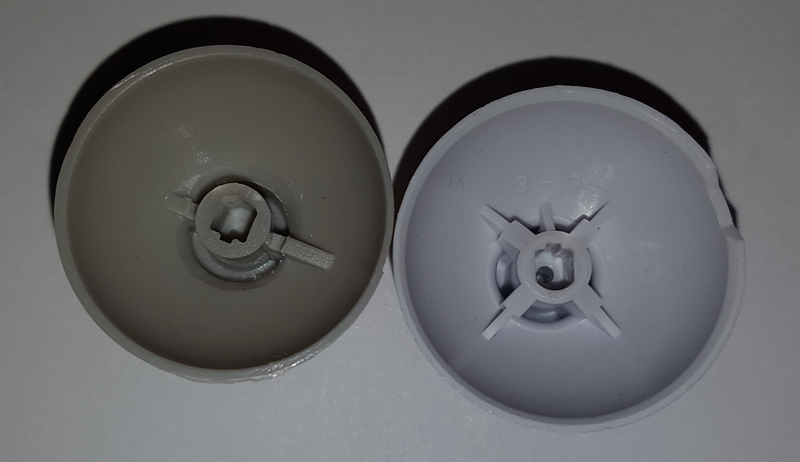 Repairing Gamecube Thumbsticks with Third-Party Replacements. 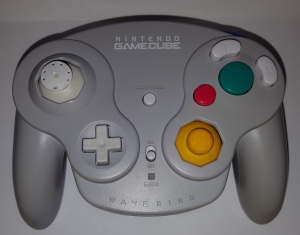 At some point we’ve all come across, or perhaps even own, a Nintendo Gamecube controller with sad, beaten and busted up thumbstick covers. 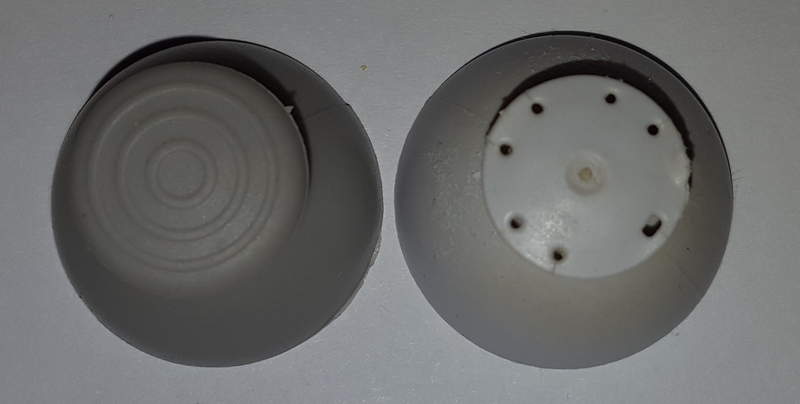 The analog directional controller and the C stick are both merely thin plastic caps with a thin layer of rubber on them for assured grip. After a few furious rounds on Smash Bros. Melee or even just through the sands of time they do become worn out. I myself had purchased a Wavebird with a destroyed analog stick some years ago. It still worked but the hard plastic where the rubber grip once was just wasn’t the same as having a nice rubbery grip to use, so the poor thing sat in my closet awaiting a remedy to become useful once again. 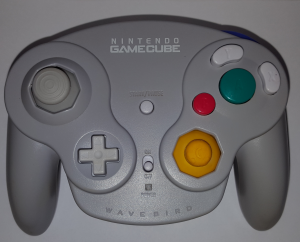 I also had a few wired Gamecube controllers in need of both thumbstick replacements, so I felt it was time to bite the bullet and see what third-party replacements were all about. After the thumbsticks arrived I noticed how cheap and thin they felt, but the rubber does feel rubbery so that’s a plus. The first thing I had to do was open up the Wavebird by removing the eight screws on the back. Thankfully that’s all the screws you’ll need to remove for this project. After you’ve separated the two halves just remove the main board and you now have full access to both thumbsticks. It’s that easy. Screw locations marked in red. After everything was apart I slid the original thumbstick off and realized the OEM thumbsticks are just as thin (shown below) and flimsy feeling as the third-party replacements. After removing the damaged one the replacement slid right back down into place. The only thing left to do now was to reverse what I had just done, making sure everything is aligned correctly and replace the screws. After all was said and done the project took less than five minutes and the results are pretty good. I can’t say how long the rubber will last but I will say that to me it feels just as good as the OEM thumbsticks on my other Gamecube controllers. I did replace a few others, even the C stick, on a few of my wired Gamecube controllers and the process is pretty much the same, except fewer screws, and everything feels great on those too. 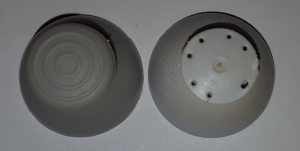 Are third-party thumbstick replacements worth buying? Again, I can’t say how long these will last, but with as cheap as they are and as good as they feel, I would buy more of them in the future should I need them. 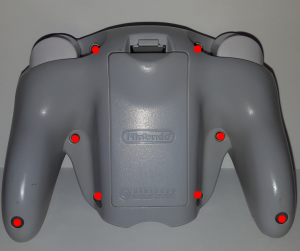 I say they’re a great investment to bring new life into that Gamecube controller thrown into a box and forgotten in your closet because the rubber has worn off the original thumbstick.